If you’re just here for the pictures, scroll to the bottom. So once again, I’m a member of the LDS church. You’ve heard us called the Mormons. Individual congregations of our church are called wards. Most wards have something like 200-300 people in them, I think. I’m also single. They have special wards for single members of the church, presumably to fulfill their social need to mingle with others of their ilk, perhaps with the idea of transforming them, in pairs, from single to married. There was once a singles ward in Los Angeles that was called the Los Angeles 1st Ward. It grew to be quite massive, so the local church leaders decided to split it into two smaller congregations, one of which retained the original name, while the other became known as the Santa Monica 3rd Ward. Now there were many friends in these two wards who now met in different church buildings on Sunday, and therefore lost much of the contact they had previously enjoyed. To help maintain those friendships, someone, somewhere along the way (I think it may have been Dana Suman) came up with the idea of having a homecoming event every year, complete with a football game and dance. Well…it’s been many years, and the originators of the concept have all moved on and in most cases been transformed out of their singleness. The tradition lives on, though. This year’s flag football game was held on the evening of Friday, September 24th (the dance got nixed, I gather). I decided to run out and see what I could shoot of it on my 7D, despite the fact that my biggest zoom lens is a Canon consumer 70-300mm with a dizzyingly slow maximum aperture of 4-5.6. So I found myself not being able to notch up my shutter speed very high (I do try to avoid motion blur for this sort of action photography), and I decided to live with noise and just go with a massive 6400 ISO. I ended up with the following gallery of shots: a collection of compromises. You’ll see plenty of noise, a good deal of motion blur, a lot of cranking up the exposure in camera raw, and plenty of shots that were just plain out of focus because I’m not good enough to focus manually, and my auto focus certainly couldn’t keep up in the poor light. Nevertheless, at least the event was archived. Enjoy. 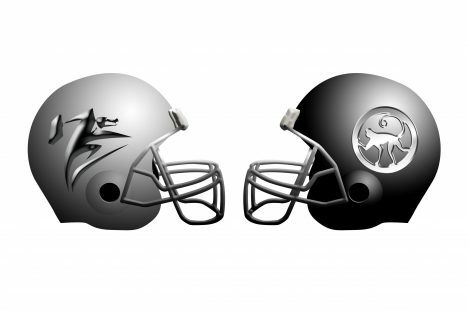 Oh..and the Silver Monkeys (SM3) defeated the Gators (LA1) 42-35. 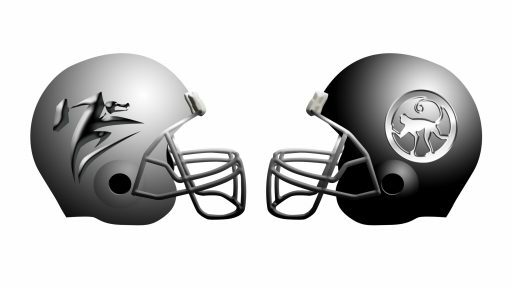 The first half looked like the beginnings of a blow out, with the Silver Monkeys going up 21-7. The Gators actually had them in the second half due to some phenomenal passing. Unfortunately, they didn’t manage to convert a key fourth down in their own territory late in the game, which turned into an almost immediate Silver Monkey touchdown. They did throw a touchdown pass on what I believe was the first play of the following drive, but that still left them still behind by a score, which turned out to be the final result.